Israel is depriving millions of Palestinians of access to a regular supply of clean water while stripping their land of minerals "in an apparent act of pillage", a United Nations human rights investigator said on Monday. Michael Lynk, U.N. special rapporteur on human rights in the Palestinian territories, said that Israel "continues full-steam with settlement expansion" in the West Bank, which the United Nations and many countries deem illegal. There are some 20-25,000 new settlers a year, he said. He was addressing the U.N. Human Rights Council, whose debate Israel's delegation boycotted due to what it considers a deep bias against it. "In his latest farcical report, Mr. Lynk stoops to a new low and (accuses) the Jewish State of stealing," Israel's mission in Geneva said in a statement to Reuters. It accused Lynk of being a "known Palestinian advocate". Israel's main ally, the United States, quit the 47-member forum last year, also accusing it of an anti-Israel slant. 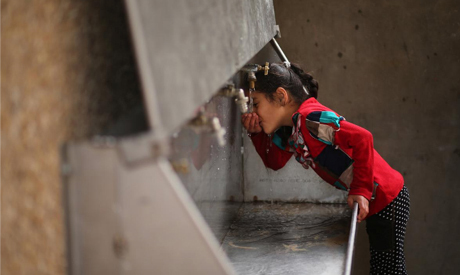 "In Gaza, the collapse of the coastal aquifer, the only natural source of drinking water in the Strip and now almost entirely unfit for human consumption, is contributing to a significant health crisis among the two million Palestinians living there," Lynk said. Despite the withdrawal of Israeli settlers and troops from Gaza in 2005, it has maintained a "hermetic seal of air, sea and land blockade" around the coastal enclave, he said. An internationally-sponsored $567 million plan has been agreed to address Gaza's acute shortage of clean water by constructing desalination plants, but analysts say its realisation is years away. "For nearly five million Palestinians living under occupation, the degradation of their water supply, the exploitation of their natural resources and the defacing of their environment are symptomatic of the lack of any meaningful control they have over their daily lives," Lynk said. In the West Bank, Israeli quarry companies extract some 17 million tonnes of stone each year, "notwithstanding strict prohibitions in international law against a military power economically exploiting an occupied territory", Lynk said. "The Dead Sea and its plentiful natural resources, part of which lies within the occupied Palestinian territory, is off-limits to any Palestinian development while Israeli companies are permitted to harvest the minerals in an apparent act of pillage," he added. "Israel must stop this pillaging, what Israel is doing in the occupied territories is very far from its obligations under international law and treaties," he said. "This is more even than apartheid."